If you could sit down to a nice dinner with Jessica Mitford and Ursula K. Le Guin I think you’d be in for a very interesting evening. I have no idea if either ever read the other’s work, I kind of doubt it actually, but they certainly read enough and wrote enough to be very interesting people. They both would have a lot of interesting things to say and would probably react to each other in ways that would make for a memorable evening. That said, the two pieces I read for today don’t really connect much at all. So this may not be my most successful round with the Deal Me In Short Story Challenge. Mitford’s piece “Trial by Headline” is a little slip of an essay. In her afterward, Mitford goes after her own writing without hesitation, picking the piece apart where it should be picked apart. She openly states that she only included it in the collection Poisoned Penmanship because it was the first essay she ever sold. Her account of an innocent man convicted by the San Francisco press for a murder he had nothing to do with does not cover new ground, even for the 1960’s. William Roughhead had already been down this road in the late 19th century. Nor have things changed much at all since Mitford’s article. I believe the Duke Lacrosse team is still waiting for Nancy Grace to apologize for all the nasty things she said about them all of which turned out to be baseless. “Don’t believe what you read in the papers” is still good advice overall when it comes to crime reporting. What struck me about Ursula K. Le Guin’s short story “The Bones of the Earth” is just how small her world building is. 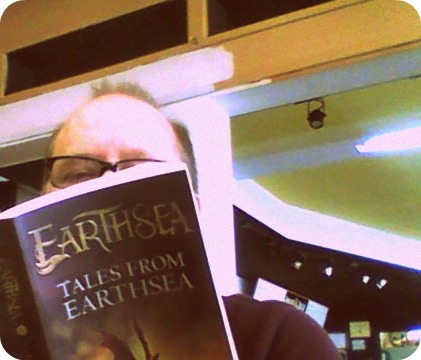 While I do think that she has created a world in her Earthsea books, her work is typically focused on a very small cast of characters, usually people who are far removed from the major action of their time. Her world’s magic is so troublesome that it’s rarely used even by the most powerful wizards. The resulting fiction is more character study than adventure. “The Bones of the Earth” is about a highly skilled wizard who lives alone with just his chickens for company. He is forced to leave his retired life when an ex-pupil of his needs help saving a nearby town from destruction. While this may sound like the start of an adventure with lots of action in it, the bulk of the story concerns the retired wizards daily life, how he cares for his chickens, how he views his memories, how is power has forced him to live a life of isolation. But don’t think I didn’t like it. While her stories remain small, I think this is ultimately where their strength lies. A small cast of characters allows me to become more involved in the life of the story than an epic cast does. Truth be told, if Game of Thrones was just about The Imp, I’d be a dedicated fan. As it is, I’m bored with half of the storylines and lost much of time with the rest. All I really need is a lonely wizard working on an old spell with just his animals for company. In Ms. Le Guin’s hands this character becomes someone I would like to know. He’s really a writer isn’t he. Working on his own to create a kind of magic. He only really lives in his own head. Sound like the artist to me. I’m with you on GoT and “The Imp” (actually there are probably several characters who Id be happy with if the series were “just” about them). LeGuin is someone I’ve not read very much of yet am always thinking I want to read more. I found your observation regarding her brand of world building interesting. Maybe a built world is a handy thing to have in reserve if you “need” it, but it shouldn’t necessarily be the main attraction of fantasy or Sci-fi. I think you’re right. The fantasy/science fiction I like best tends to be just that, a story not intended to be a grand tour of an entire world. We all live in a small part of a huge world that we all know a great deal about. I have read a lot about LeGuin and want to try both the Earthsea trilogy (recommended by my son) and some short stories. Very interesting points you make here. You can count me as a fan. A Wizard of Earthsea is still probably the best place to start.